How do you get rid of headache? Not just any headache, one that lasts and lasts... 43 days. Yup! That’s how long mine lasted - 43 daze! It was a headache caused by a virus and not a migraine, so my usual routine did not work. It was much more like how not to get rid of a headache! 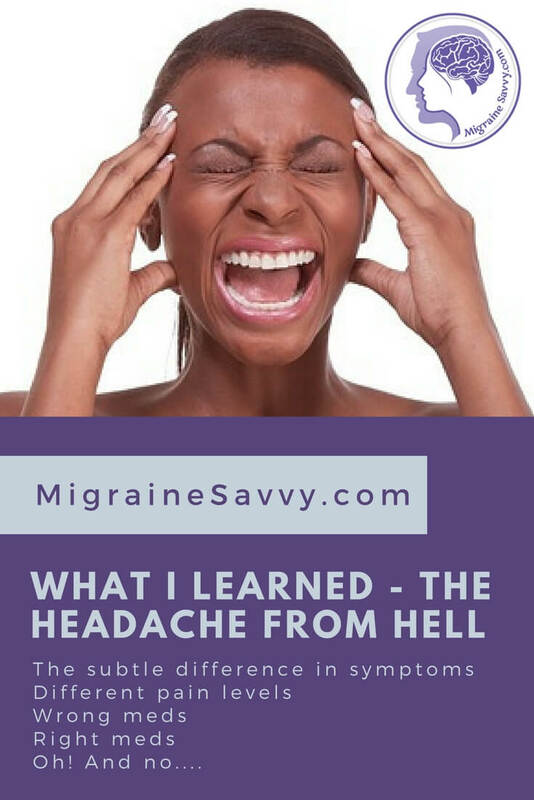 This turned out to be the most expensive headache ever, so if you get these long headaches from hell, let me give you some tips. My first tip is to take the most effective pain meds. Sounds right ... right? The symptoms were very unusual for me, but similar to common migraine symptoms. A few headaches turned into migraines but these are what symptoms I did not get: my eyes did not crush, my neck did not feel like it was hit by a crow bar, and there was no light sensitivity. There were these symptoms: dull ache on left side of head, nausea, dizziness, oh the dizziness (barf gag yuck), and an ear ache. Please note – with any unusual head pain, please see your doctor as soon as possible or go to your closest emergency room. So let me tell you my story... but if you want to skip this bit and get straight to the solution click here. I am sitting watching TV, and all of a sudden this wave of dizziness and nausea comes over me so intensely that it sweeps me over onto my side. Boof, onto the sofa I flip saying to my partner "this is horrible, get me a bucket" (good old Monty Python)! I toss up going to the emergency room for a visit but I can't move. After about 2 hours I make it to the bedroom with bucket in hand. I throw up a few times and pass out with the room spinning. This is very similar to my early migraine years. That lasted for 12 solid hours and then lightened up but I was still holding on to walls to stay upright. At 9am sharp, I called to book an appointment with my new doctor who was kind enough to squeeze me in on his lunch hour. A Pat On The Head And "You'll Be Right"
Now, the week previous to this new sailing adventure that was going on in my head, I did have 3 nights of ear pain that kept waking me up in the middle of the night. I know nothing about ear problems. This is why I tell you to “doctor shop.” Some of them can be so dismissive, and I don’t want that to happen to you. Although, in hindsight it would have been cheaper. Anyway, after this dizzy vomiting episode, my lovely new doctor (Dr. S) saw me in his lunch hour ($170). He listened to me, took me seriously, and then did a very nifty suction treatment in my ear, called and booked me in for an MRI ($250) and then gave me a list of places to go for a hearing test ($100). He said to book in a soon as possible and that if these symptoms got any worse, to go to the emergency room. I was, after all, holding onto things to walk, and bumping into walls …. doing my very best not to vomit everywhere as I sailed the bumpy sea! The Most Expensive Headache Ever! Thankfully the MRI was clear, but the hearing test showed huge reduction in my left ear over my right – no surprise there! I had completely lost the hearing in my left ear and I was terrified. I am a counselor, just fyi. Hoping this was not some mean twist of fate, I did a lot of praying and then called a friend who is a nurse. She spent a whole hour explaining to me what could be happening. And that, that single conversation, relaxed me into thinking I could handle this. Sometimes, all you need is the right information at the right time, and you can be more relaxed about things happening in your body. What a difference gathering more information from my nurse friend and a concerned doctor made. He also recommended increasing my Vitamin C dose to 9,000 milligrams a day or up to bowel tolerance. I saw him again for results ($170) and because there was “nothing extraordinary” he suggested I see a local Ear, Nose and Throat (ENT) specialist ($160), who they also called and booked me in to see. So four places in one week: doctor, radiology, hearing test, and ENT doctor. Then back to doctor for those results... cha ching $930 so far in total! I really did not want to add that all up to see what it cost me to get rid of headache. But I was concerned enough to find out what was going on. This was not my normal migraine. And I hadn't eaten anything in days, that stayed down. What I did realize was the difference between migraine vs headache symptoms for me. I don’t recall ever getting a headache! But I get lots of migraines so here's what I noticed. Knowing your typical symptoms is really important. These are mine: eyes crushing, nerve pain coming up through my neck, olfactory hallucinations, sensitivity to light, sound and nausea. And I always smell smoke. The headache was bland, blank. I could not think coherently with the ear pain but the headache was a flat, dull, ache mostly across my forehead. So incredibly different to a migraine in hindsight. Oh and no anxiety from the adrenaline rush. Do you get into a state of panic before an attack? I do, and there was nothing like that. I felt quite peaceful and safe inside this new silent space. So, we reach the end of the story, with a very happy ending. After 43 days of constant headache from the ear pain, it has gone. It took me a few weeks to realize that this was a 'normal' headache from a virus. 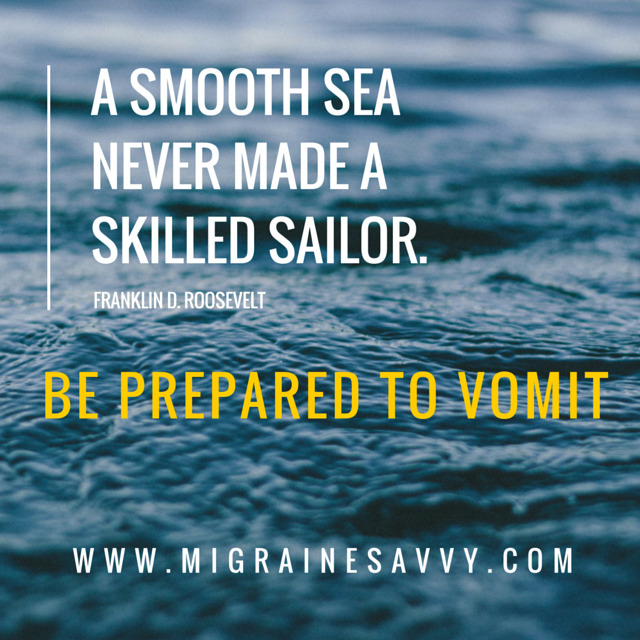 The biggest lesson is the reminder that headaches can be relieved by over the counter medications, and migraines can't. Taking the wrong medication is how not to get rid of headache! There was nothing on the tests to explain the pain or hearing loss. The ENT specialist didn’t really know the diagnosis, but guessed at: Vestibular Migraine, or Vestibular Neuronitis, which are conditions I would have to manage for the rest of my life with physiotherapy. Finding my new balance in life, literally. The thought of being this dizzy and nauseous forever, was really disheartening. Perhaps I could take up sailing for real, I was trying to think positive. I did discover how to get rid of headache with the right medication and to trust talking more with my medical friends. A doctor friend of mine suggested taking the supplement Lysine as I had shingles a year ago. It was the same location in my head, and within two weeks of taking that I could hear again. So who knows what really worked, but I am relieved. Remember to ask friends, sometimes they are delighted to help. I hope this article helps clarify things so you never need to suffer needlessly or as long as this. There is not always one easy way to get rid of headache. Make getting to the doctor to get rid of headache that lasts and lasts your number one priority. It is important to include what other health conditions you have as to what will help you get rid of headache. Writing down your symptoms and what you have tried that has worked or has not worked before you go to the appointment is important too. This way you can have a clear way to communicate if you are feeling too foggy to think clearly. So to get rid of headache effectively, you must know what to take. If you want to use medications for relief, you must consult with a doctor, in my opinion. Don't self medicate. Since I've recently moved, I continued to doctor shop. I found two good ones: the first one prescribed Serc® (betahistine dihydrochloride 16mgs by Abbott) half a tablet, twice a day for the dizziness and nausea. That worked effectively. The second doctor reassured me that we could trial something else that might help. She recommend Lyrica and a rehabilitation physiotherapist to help with regaining my balance. It pays off to doctor shop, if you can. I know in Canada and the UK for example you are assigned a physician and you pretty much have to stay with them for life. Different medications work for headaches that just DO NOT WORK for migraines. I took my migraine meds (Naramig and ibuprofen) and the dull ache did not go away. I took Paracetamol is also known as acetaminophen (Panadol® here in Australia) and it went away quickly. But how to get rid of headache can be really tricky, so please make sure you work with your doctor. I am a strong supporter of natural therapies when they work. But I rarely recommend self dosing. Make sure your doctor knows about all the complementary therapies you are using so s/he can help you more effectively by having the whole picture. It's important to try to make your ongoing relationship with your doctor an open and productive one. I suggest experimenting to find what medications work to get rid of headache under your doctor's supervision. That way, you have the medication that you know works, and then you can choose alternatives and complementary therapies to see what else works if you prefer a natural treatment. The book Living a Healthy Life with Chronic Conditions says that to get the most from your doctor visits you should P.A.R.T. - "Prepare, be active, repeat, and take action." I cover this in depth in my migraine pain management course. Come have a look, it's free to enroll. 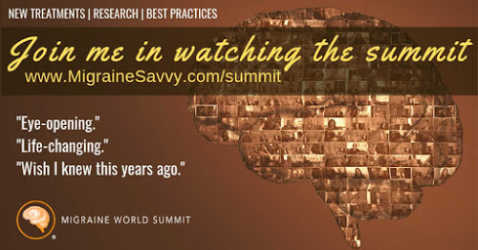 • Chronic Daily Headache Treatment: Is It Time For A Miracle? Get Rid of Headache Source: Lorig, K. DrPH, Holman, H. MD., Sobel, D. MD., Laurent, D. MPH, Gonzalez, V. MPH, Minor, M. RPT, PhD. (2013) Living a Healthy Life with Chronic Conditions: For Ongoing Physical and Mental Health Conditions (4th Edition). Bull Publishing: Boulder, Colorado.